Once you add layers and columns to your project, you can modify their properties, names, or ordering. 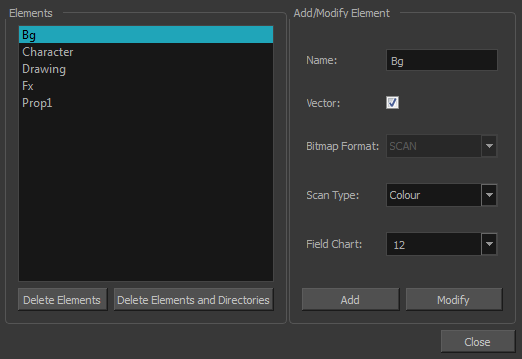 The Element Manager window lets you add, delete or modify elements (drawing folders) in your scene. 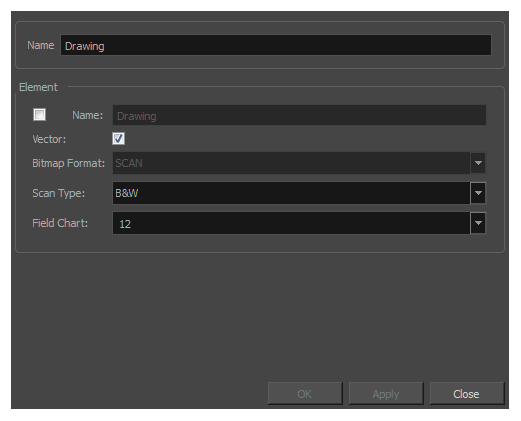 If you have drawing folders that are not linked to a column in your scene, use the Element Manager to delete them if needed. ‣ Drop the selection on an existing layer to make it a child of another element layer. ‣ Drop it between the existing layers. Timeline layers that are located above the selection are displayed in front it. Layers located under it in the Timeline View are displayed behind it. ‣ From the top menu, select Scene > Element Manager.